At least, we think of stars as tiny little things. But they are not. Each one of those “little stars” is a sun. Our sun is over a hundred times the diameter of the earth. Over one million earths could fit inside it. Those “little stars” that we see twinkling in our night sky are actually vast balls of intensely hot nuclear reactions reaching temperatures of over twenty-five million degrees at their core. If we were to travel too close to one of those beautiful little dots of light, we would first be burnt to a crisp, and then vaporized. We see them as tiny points of light only because we are so far away from them. And that is good to keep in mind as we contemplate, with the wise men, the star that led them to Jesus. The star that we think of as tiny is, in fact, far larger and more intense than anything our experience has prepared us to imagine. 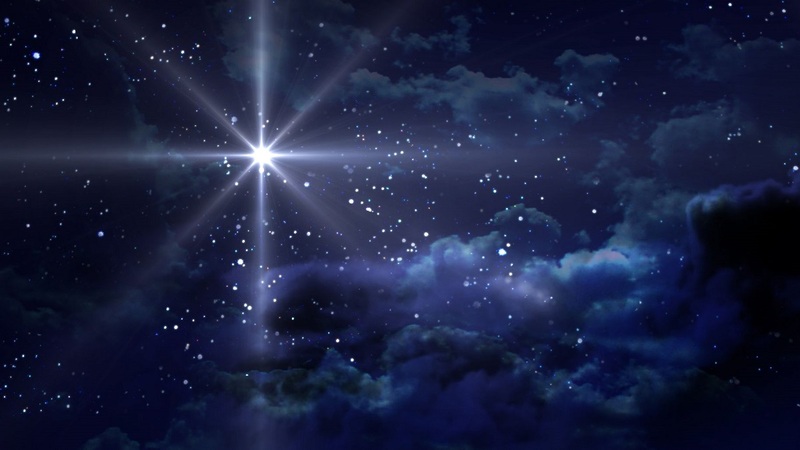 The first thing the wise men had to do in order to see the star was to look up. None of the priests and teachers of the law in Jerusalem saw the star. Their eyes were too focused on their books and their laws and their politics to even notice the sign of the new king’s birth. The wise men were willing to look up—and they saw a star in the east that would lead them on their journey. We, too, must be willing to look up. We must be willing to look beyond our jobs and our books and our families, and all the pressing cares of this world. We must be willing to clear our minds from time to time of all those cares, and lift the eyes of our minds beyond the things of this world to the deeper matters of spiritual life. Otherwise, like our furry four-footed friends, our gaze will be constantly fixed on the grass and dirt in front of us, and we will never notice the far greater heavenly beauties that await our wondering eyes. And the wise men were willing to do something else—something that made them not merely smart, but truly wise. Once they had lifted up their eyes and seen the star, they were willing to follow it wherever it led them. They were willing to leave behind their familiar surroundings and travel to a distant land, seeking the one who was born king of the Jews. And so they went on their journey, taking weeks, months, perhaps even a year or more to reach a destination that was still unknown. We, too, if we are to be wise and not merely smart, must be willing to follow the star of spirit where it will lead us. We must be willing to pick ourselves up and leave behind our old familiar attitudes and patterns of thinking and feeling. We must be willing to travel to a distant new land in which we will think new thoughts, feel new loves, live renewed lives. We must be willing to relinquish our own control to the newborn king within us, journeying not where we would prefer to go, but toward the Bethlehem of our inner Holy Land. On the way, we need to consult the Bible, and even the teachings of the church. The wise men did not find the child on their own. The star did not lead them directly to Bethlehem. To reach their destination, they had to consult with King Herod and the priests and teachers in Jerusalem. And in the end it didn’t matter whether those leaders were holy or corrupt. In the end, it doesn’t matter whether the church is full of hypocritical leaders and imperfect people. What matters is that the church, with its most precious possession, the Word of God, gives us the detailed guidance we need to focus our journey in the right direction. Renewed in this knowledge—the knowledge of who Jesus is and where he may be found—we can once again see the star of spiritual insight guiding us right to the place within us where we can encounter the newborn Lord for ourselves. Because our meeting with the Lord Jesus Christ is not something that happens in the church, but in our hearts. With joy, the wise men saw the renewed and brightly gleaming star, and it led them right to the house where the child was. This was no ordinary, physical star. A star in the physical sky could never have rested over a single house. This was a star seen with their spiritual eyes. We, too, can see that star guiding us to the Lord Jesus if we are willing to lift up the eyes of our spirit to deeper things, and journey from our usual attitudes and habits toward its light. And if we do, in the course of our journey we will find, not a tiny little star, but a vast, all-encompassing Sun of Righteousness rising in the spiritual east of our lives with healing in its wings (Malachi 4:2). What is the Meaning of Gold, Frankincense, and Myrrh? Several captivating ideas and lessons here. To look and follow! Good to hear from you, my friend. I hope you had a wonderful Christmas! Thanks for your kind words. It is my pleasure and my joy. Here’s wishing you and yours a good New Year. I want to thank you and your wife for all your work, and also ask a question. However, before that, I have to tell you that I’m a human being that feels lost. Indeed I feel like this and I cannot even remember when was the last time that I felt comfortable regarding my spiritual world. Because I lack it. I do not have a spiritual world inside of me, and the reason for that is as simple as the thought that all these religions make a fuss on their autenticity, which was what lead me to ask myself about what should I believe in. And this, Mr. Lee, is my question: is it wrong if I am willing to study the paths and the religions which I myself think that are good? Right now I’m taking a look on the Bible and I’m trying to grasp the principles in this. The problem is that it is too much material, and I do not have the time to study all of it, so I’m asking you with all my heart to help me regarding this matter. Where should I read in order to grasp “the core” of the Bible? Those things which are the most important, where are those? I also read the article about religions and the true God, and I pretty much liked it. You are very welcome. I’m glad the articles here are giving you some help. The thing about being lost is that it can take a while to get out of it. You may have to wander around for a while before you find your way back to “civilization.” But one thing that often works for people who are lost is to follow a stream or river downstream. Eventually that will usually get you to a town, if you don’t die first. Spiritually, a stream is a sense of the truth. Little streams join larger streams, which join larger ones, until they become rivers, which are great collections of flowing truth, spiritually speaking. The Bible is indeed a huge, complex book. That’s why Jesus distillation of “the Law and the Prophets” (which, in his cultural context, basically meant all of Sacred Scripture) down into those two basic laws is so helpful. If you read the Bible with those two commandments in mind, its meaning and message will gradually become clearer in your mind. If you really want to delve into the Bible and gain some good, spiritual life lessons from it, I would recommend purchasing one or more volumes of the Bible Study Notes by Anita S. Dole. You can see my review of them, and links for purchasing them, here. If you have any specific questions you want to ask, please feel free to post further comments. And may God lead you out of your confusion to a sense of clarity and direction. Thank you so much for your time and kindness, Mr. Lee! I am going to read those articles soon, followed by checking those Notes. Mr. Lee, what if I cannot see any river? What if my eyes do not want to see? What if my mind cannot accept the path to faith? What I want to say is that I do not know how to find my lost faith. I think this is something I did not know when I wrote the first message; the existence of a God and the power to have faith, Mr. Lee, are my main concern. I know there is not much that others can do to help me, but could you at least tell me what I should do when there is neither fire nor flames in me? A sparkle is all I need. At last, there is one more thing… What destroyed my spiritual world was the science. It is everywhere around me as it is what I study, and there is nothing I can do about it but to somehow create some space for spirituality. You are very welcome. It is my pleasure. Is the problem that what you’re learning from science conflicts with what you have been taught about God, religion, and the Bible? If so, then you’ve come to the right place. Emanuel Swedenborg (1688–1772), who wrote the theology and Bible interpretations that especially inform and inspire Annette and me, had a career as a scientist before he turned to religion in his mid 50s. You might be interested in this contemporary biography of him: A Scientist Explores Spirit. The link will take you to its page on the publisher’s website, where you can purchase a print or Kindle copy or download a free EPub or PDF version. I understand that at this point in your life you feel that you might not be able to have faith. May I suggest to you that faith is a choice on your part? Speaking for myself, when I was in my late teens I realized that I could choose to reject God, and everything I’d learned about God, spirit, and the Bible, or I could choose to accept them. And I knew that whichever choice I made, I would convince myself that I had made the right choice. I chose to accept God and spirit because I believed then, and continue to believe now, that I would be a better, kinder, and more thoughtful person if I chose to believe in God, and that the world would be a better place with God present rather than absent in it. However, that was my choice. You’ll have to explore and consider for yourself, and decide whether you do or don’t want to believe in God and follow God. You’re already taking some good steps by seeking out more understanding, and keeping your mind and heart open to the possibility that you could regain your faith. And I believe that if you do travel down a path toward faith, you will find a much stronger and deeper faith than the one you left behind. I hope the articles here at Spiritual Insights for Everyday Life will help you on that quest. And of course, if you have further questions or concerns, please feel free to leave more comments. That’s what we’re here for. Thank you so much for the time! You have helped me a lot and I feel like I might be able to find something, sooner or later. I will be back with more questions when the time will let me do so. You are most welcome. I look forward to hearing from you again when time permits and the spirit moves you.